These days you can send nearly anything in the mail: Glitter! Poop! Farts! Gummy peens! And now you can send tea bags too. 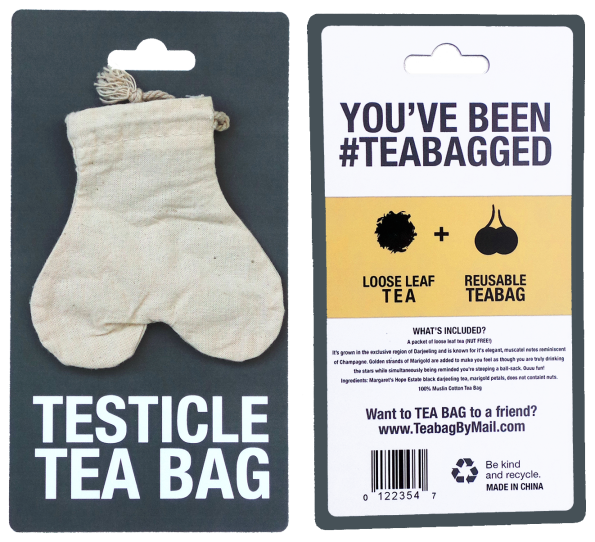 Tea Bag By Mail is a service that will anonymously deliver your enemies a testicle-shaped tea bag. It’s reusable AND comes with a BONUS packet of nut free loose leaf tea. I see what you did there. Not saying I like it, but I see it. Jk, I totally like it. I, too, have the mind of a 12 year old. You’re right — I’m being generous. My mind is 11, tops. Thanks to Brody for sending in the tip! before I read the caption, I assumed it was a ‘personal’ article of clothing for the northern nudist. Please refer to my essay under the SCROTUM-shaped bike light! This item, too, is shaped like a scrotum, not a testicle. Testicles are shaped like olives, sort of. Not the kind that have been drilled out and stuffed with something. Ugh, God, that hurts to even think about…oooooooooooooouuuuuuuuuugh! Never mind.